Anyone skeptical about the benefits of using LED technology for functional task lighting that’s also fashionable will have their doubts put swiftly to rest by the Z-Bar High Power LED Desk Lamp. LEDs pack a bit lighting punch in a small package. The Z-Bar takes advantage of this by placing six high-power LED arrays in a super-slim arm that’s only 0.5 inches high x 0.75 inches wide. This arm is just one of three that stretches, pivots, twists and turns in an infinite number of positions to properly direct light in working and living spaces large and small. The LED arrays have a rated lifespan of 40,000 hours. That means that you could run this lamp eight hours a day, 365 days a year, and this lamp’s lights will still last nearly 14 years before needing to be replaced! 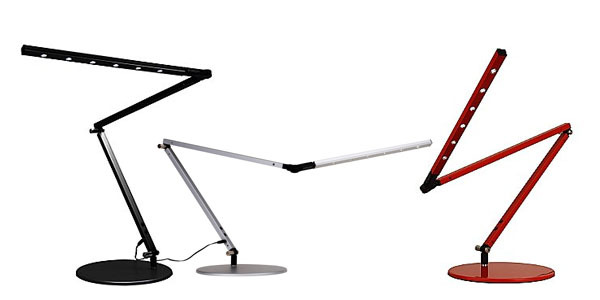 In other words, the Z-Bar Desk Lamp makes the perfect gift for anyone who’s a fan of contemporary, space-saving design, is intrigued by the latest technology…and is lazy about changing light bulbs.